When I saw the title and description, I thought it is a work of fiction, focused around engineering study and life after that. But the book turned out to one with lots of serious gyan. I am an engineer too, now working in an IT firm and doing things far different from what I studied for four years. So I can connect 100% with what author has tried to explain and I am with him 100% on all his viewpoints. If you are thinking of joining engineering college, already studying there or have completed your BE course or are aware of someone being forced by family/relatives to join engineering, ‘Wasted in Engineering’ is a must read. From my reading, I have given below some high level essence of the book, Wasted in Engineering, written by Prabhu Swaminathan. Do read the book for complete information. - Parents see engineering as a way out of poverty and a guaranteed entry to a well-paying job. But the truth is only a small fraction of engineering graduates manage to land a decent job after college. - Many students are forced or blackmailed into engineering colleges against their personal wish or desire to study something else. This half hearted study of engineering often kills student’s main hobby/interest. - Lots of people realize late in life that Engineering is not their area of interest. They end up taking any job that gets them some money- bank POs, pubic services anything. If they had a provision to identify and pursue their passion earlier in life, several wasted years could have been saved. - Though constitution of India gives lots of fundamental rights to every citizen, many engineering colleges think they are above law and enforce lots of rules taking away fundamental rights of students- rules like boys and girls shouldn’t talk, what girls should wear and so on, mostly bundled under the name ‘discipline’ are common in many engineering colleges. Anyone who tries to explain with rationale and reasoning against management’s decision is branded and troubled in various ways possible. - It is never too late- Author explains a way out depending on what stage you are in- still in school, studying Engineering, just graduated etc. - There are several real life examples shared- from Arvind Kejriwal to Hemant Karkare to KV Kamath- you will find dozens of examples around you of people who studied engineering but shifted careers mid-way and became successful/popular in their alternate career path. - Prabhu has also shared his own example and few examples from his immediate circle of friends and family members. I learnt that Pradeep of Hellbound bloggers is Prabhu’s brother. 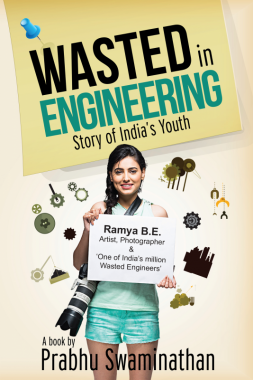 Overall, the book, ‘Wasted in Engineering’ stands as a voice of every individual who is an engineer by education but wanted to be something else in life- may be journalist, photographer, writer, artist, sportsmen and so on. It is also a quick guidebook for everyone involved in or related to Engineering studies- parents, colleges, corporates and so on. It is not a book of fiction written for entertainment purposes, so don’t expect any campus love story or corporate saga. But the harsh truch listed in the book are real- if it can prevent at least a few more people from becoming wasted engineers then author’s effort is worth. I bought the book on flipkart directly from publisher who was also a seller on flipkart. Unfortunately book had no discount when I bought. You can finish reading it in one sitting- it is about 150 pages long and not difficult to read- more so when you can connect yourself to the points listed in the book. The first few pages itself hint that the book has no sweetener and you should expect a brutally honest, on your face points to ponder upon. Cover image taken from publisher's website. Nothing is a waste. Just that we don't learn anything from the engineering syllabus and the cost of that learning is darn expensive!! Nice to know that someone has written a book on career dilemma of Indian youth. On the other hand,people pursuing careers in fields different from their degrees, is not new. Earlier too, people used to complete a degree (BA, BSc, BCom) and would pursue a career in the field they got job unrelated to their field of study. Only thing as you mentioned BE looks like a lucrative option. Also, with the number of engg colleges and open economy, it is a mathematically certainty that you will end up in a engineering college and land up in a IT job only because IT offers the biggest chunk of jobs. With regard to people pursuing different field of engg than they studied, it is because IT needs engineers and an Engg college can't just have Computer Science branch only because of regulations. So, what you get - set of engineers of all branches landing in a IT job. During our counselling for engg seats, I remember people used to go for a good engg college rather than a preferred branch of engg.